A lavish and lovingly crafted diamond bridal ring set from Perfect Fit. Featuring a sparkling princessa engagement ring in 9ct white and rose gold, alongside a chic 9ct white gold wedding band, half set with a row of glittering diamonds. Finished with two secret sapphires as a symbol of your love. 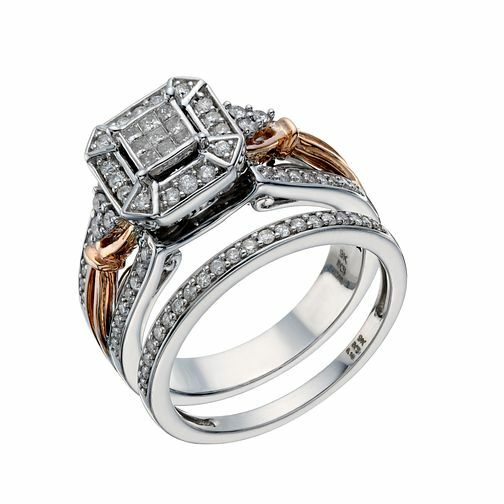 9ct White & Rose Gold 1/2ct Diamond Perfect Fit Bridal Set is rated 5.0 out of 5 by 2. Rated 5 out of 5 by Anonymous from Stunning in real life This ring is so unusual and admirers admit even not to their taste, that it is truly a stunning ring. If you like a thicker banded ring, a little weighty this is the one! Think great gatsby, Art Deco, 1920’s feel. I adore this ring and after a month can’t stop looking at it.